The hooded sweatshirts have drawstrings through the hoods, which can pose a strangulation or entrapment hazard to children. This recall involves about 900 hooded sweatshirts. The children's hooded, zippered sweatshirts have drawstrings through the hood. 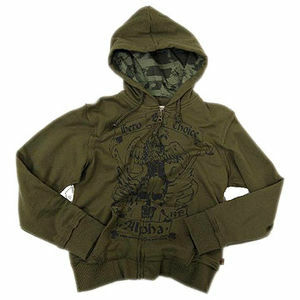 The cotton sweatshirts are olive green with an eagle on the front and the words "Hero by Choice" and "Alpha." They were sold in sizes 2T, 3T, 4T, 5, 6, 7, 8, and 10/12. "Alpha Industries" and "RN#35569" are printed on a label sewn into the neck of the sweatshirts. Department stores and teen stores nationwide from August 2009 through February 2010 for between $28 and $42. Immediately remove the drawstrings from the hoods of the sweatshirts or return them for a refund. Consumers can call Alpha Industries toll-free at 866-631-0719 between 9 a.m. and 5 p.m. ET, Monday through Friday or visit alphaindustries.com.